Michael-In-Norfolk - Coming Out in Mid-Life: Georgia's Gubernatorial Race - Will Georgia Follow Virginia? Georgia's Gubernatorial Race - Will Georgia Follow Virginia? would become the nation’s first female African-American governor if elected. The Republican won the nomination Tuesday after branding himself a politically incorrect conservative who would “round up criminal illegals” and haul them to the border in his very own pickup. The Democrat all but opened her campaign by demanding that the iconic carvings of Jefferson Davis, Robert E. Lee and Stonewall Jackson be sandblasted off Stone Mountain. Almost overnight, Georgia’s captivating governor’s race between Brian Kemp and Stacey Abrams has taken on the dimensions of a defining moment, one that will, regardless of outcome, determine what the state represents and how it is perceived. That voters chose these two candidates reflects how Americans are embracing politicians on the basis of culture and identity, and how Georgia’s politics are catching up with its rapid demographic change: The nonwhite population has grown to 40 percent from 29 percent since 1990. But Georgia’s political middle, long the dominant force behind the state’s thriving commerce and pragmatic leadership, suddenly finds itself all but abandoned. [T]he 2018 campaign is a point of demarcation. In the five decades since the death of legal segregation, the image-conscious state has been led by a succession of white male centrist governors — first moderate Democrats, then, for the last 16 years, right-leaning Republicans. They have more often than not been steady and bland, focused on improving education, corporate recruitment and job growth. Ms. Abrams, 44, a brainy Yale Law graduate from Atlanta, has leveraged the prospect of becoming the country’s first female African-American governor to nationalize her campaign and its fund-raising. By contrast, Mr. Kemp, 54, is a drawling agri-businessman from Athens who has revived a populist style that has lain dormant in Georgia since the late 1960s. Both campaigns say they are committed to maximizing turnout by their most rabid supporters rather than moderating in order to broaden their appeal to centrists and independents. Mr. Kemp, the Democrats fear, will take Georgia the way of North Carolina and Indiana, which were tarnished by recent legislative battles over issues like gay rights and the use of public restrooms by transgender people. Former Gov. Roy E. Barnes, the last Democrat to hold the office, mourned what he depicted as the disenfranchisement of the state’s political center. . . . Mr. Barnes asserted that neither he nor his two Democratic predecessors, Zell Miller and Joe Frank Harris, could have won their party’s nomination today. Nor, he speculated, could the state’s center-right senior United States senator, Johnny Isakson, win in a Republican primary if he were running without the benefit of incumbency. Ms. Abrams streaked into the general election after taking 76 percent of the vote in a two-person primary in May. The results seemed to validate her strategy of registering thousands of young and minority voters and exciting them with an unapologetic appeal to the left. Turnout in the Democratic primary was two-thirds higher than in 2014, nearly equaling that in the Republican primary for the first time in a dozen years. The state’s demographics are shifting rapidly in Ms. Abrams’ favor. Over the last 20 years, when the state’s population ballooned nearly 30 percent to 10.4 million, the share of registered voters who are not white increased to 46 percent from 27 percent, state election data shows. Two of the suburban Atlanta counties that fueled the Republican rise — Cobb and Gwinnett — are now so populated by immigrants and African-Americans that they voted for Hillary Clinton over Mr. Trump. [T]he question for Ms. Abrams will be whether the electorate has changed enough that a well-funded ground operation can transform a trend into victory. Mr. Kemp tied himself inseparably to Mr. Trump. And with shotguns, chain saws and a Ford F-350 as props, his ruthlessly effective ads transformed a man largely unknown into a swaggering defender of restricted borders and the Second Amendment. Mr. Kemp reiterated his support for state legislation that would replicate a federal law providing legal protection to individuals and businesses who tailor business practices to their religious beliefs. Opponents of the laws, which exist in several neighboring states, argue that they allow discrimination against serving or employing homosexuals and transgender people. 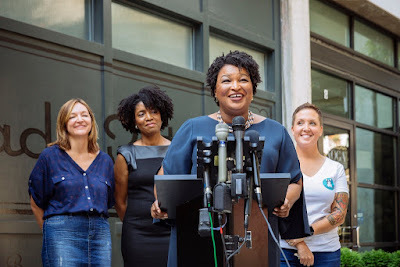 That pledge, and the countrified image Mr. Kemp created for himself in his ads, has prompted nervousness among some business leaders, particularly in Atlanta. . . . Concerned about condemnation and boycotts, business leaders convinced Mr. Deal to veto so-called “religious freedom” legislation in 2016, but some wonder whether they would have the same success with Mr. Kemp. A.J. Robinson, president of Central Atlanta Progress, a downtown business group, said industries that normally support Republicans were waiting to learn more. State Representative Brenda Lopez, a Democrat from Gwinnett County, said voters needed to consider the long-term consequences of the campaign and November’s vote. Virginia's image has been enhanced nationally and internationally by the rejection of GOP hate, bigotry and focus solely on the wealthy and religious extremists. Georgia has an opportunity to do the same. I will be keeping my fingers crossed for Ms. Abrams.